Red bolero jacket (Vero Moda), cream sleeveless ruffled front bow blouse (Vero Moda), brown tweed skirt (Kenzie), brown peeptoe oxfords (Unlisted), faux Gucci eelskin bracelet (gift), gold ethnic earrings. My featured brown today is the tweed skirt. This is a wool/linen blend and the tweed has little flecks of orange, red, blue, green and yellow in it, so it pairs well with pretty much any colour. I forgot I owned the bracelet! Mom and Dad bought this for me in Italy about oh...20 years ago. Wow, it's really been that long. Of course, it's not really Gucci (the Gs are going the wrong way), but it is actually eelskin and it's 24K gold plated (at least, that's what it says inside). Frayed tweed wool jacket with detachable hoodie (Oxmo), black cami (InWear), black sleeveless t-shirt (Jacob), green cords (Esprit), checkered Vans, silver triple hoop earrings. Yee haw! We're off to see Beck in concert tonight, so naturally, this calls for a change of clothes. Must be: comfortable, suit the artist (ie. not Judas Priest), and be walkable since it's only a 20 minute walk to the venue. Black shrug (Debut), patterned sleeveless blouse (I.N.C. 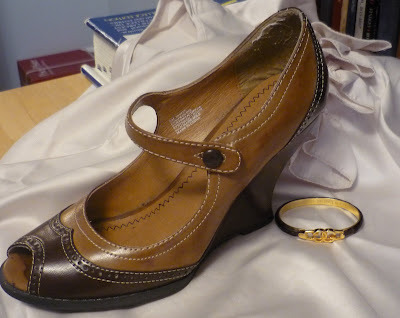 ), brown pants (Mac & Jac), red peeptoe platforms (Le Chateau), gold hoop earrings, hammered gold cuff. Featured items: the new shrug and the brown pants. I do love a shrug - they are indispensable (especially in black) for wearing with sleeveless shirts, blouses and sweaters for work, as well as strappy dresses for evening, when you don't want to wear a strapless bra or show your shoulders (not appropriate in the workplace most of the time). I had a black shrug a few years ago, but it was given away when I lost weight as it was too big. The brown pants are a beautiful fit - they are a nice crepe weave with some stretch to them. They do hang a bit low, though, so I'm going to have to wear a belt with them. They replace my old brown pants that were a purchase prior to losing the last 10 pounds - gave 'em to Ruth. I adore this blouse - it is an extravagant purchase for me, being pure silk and not washable, but I watched until it went on final clearance at the Bay & managed to snag it (the last one was in my size! Woo!) for around $26. Regular price was $78, I think. Considering I have to dry clean it (boo, hiss) every few wears, I'm not paying full price. Turquoise jacket (consignment, Gap), brown satin blouse (Esprit), cream cami (Vero Moda), brown lace pencil skirt (Planet), Cruise Ship Shoes (Franco Sarto), leopard belt (Plum), gold filigree earrings). Voila! Transformed into another outfit, just by untucking and belting the blouse! I resisted doing the leopard pumps with this - grrr, it was hard! But I thought the Cruise Ship Shoes worked better, since the light tan picked up that same colour in the belt and the stitching on the jacket. Brown/turquoise/red pattern blouse (Mexx), denim pencil skirt (Smart Set), brown belt with shiny gold buckle (Plum), turquoise shoes (Jeffrey Campbell), red bead bracelet, gold disc earrings. I'm doing brown as a theme this week, exploring some of the many ways it works in my wardrobe (okay, I bought a lot of stuff with brown in it during my shopping trip, so I'm showing it off). I've always been a fan of this nice rich, chocolately brown, and it lends itself well as a neutral. 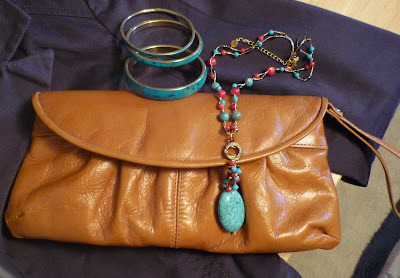 Today: with turquoise and red, one of my very favourite combinations. It looks totally different with a brown background! I know the pink leather interior of the shoes clashes something awful, but they are just so fantastic. Repeating the red bead bracelet from Friday. Black and white blouse (consignment), pale grey pants (The Gap), black jacket (Simply Manakin), black kitten heels (Kenneth Cole Reaction), red-orange wood rose earrings, red bead bracelet, blue bag. Elaine and I planned a shopping trip last night after work, so I had to factor that in to what I wore yesterday. Must be able to walk in the shoes, must be able to slip the clothes on and off easily. Accessories must not get in the way when trying stuff on, and must not snag on the clothes. I felt nice and comfy in this all day. I quite like these pants, even though the light colour tends to make me feel that my thighs look large. We had a great shopping trip. Elaine got a grey wool cropped jacket, a cropped green jacket and a great cream and black dress (don't take it back!). Some great sales on. I got a new pair of brown trousers to replace my Plum ones, which are too big, a brown satin blouse, a brown/turquoise/orange patterned blouse, a cream ruffle-front blouse, a black shrug, and a blue satin turquoise dress. I will be planning all my outfits this week to show off my new purchases. I'm trying to stock up on basics, getting ready for fall. White shirt (Plum), blue/green/white silk & cotton skirt (consignment, Club Monaco), leather 2-buckle belt (Jacob), black kitten heels (Wild Diva), green stone and bead bracelet (handmade gift), silver hoop earrings. I usually don't do the white cotton shirt - I just am not a fan of it on me. I realize lots of women swear by it, but I just don't find it all that exciting. However, there are times when it comes in darned handy, like when you have a skirt that goes with NOTHING. I absolutely love this skirt. I got it at my favourite consignment store about a year ago - it was brand new, still had the tags on it, only $26. For Club Monaco?? Crazy! Regular price was over a hundred bucks. The pattern and colours are lovely, but nearly impossible to match, so I tend to wear this with either black or white or both. 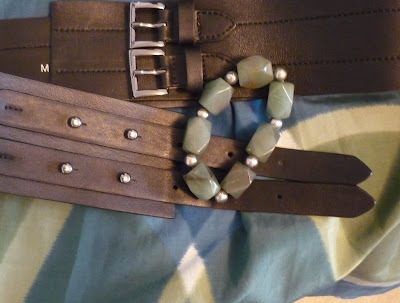 Close-up of the belt and bracelet. My friend Greg's ex-wife made the bracelet for me. I'm not really sure why, since we weren't friends (I liked her, don't get me wrong, but we didn't hang out or anything). I think of it as my Betty Rubble bracelet. Am I the only one who names my clothes and accessories? Long grey jacket (Ricki's), purple ruffle front blouse (Esprit), jeans (Esprit), purple shoes (Bronx), black/silver bracelet and earrings. Do I look tired? I am tired. Not a lot of effort in the outfit. I wanted to wear this blouse, which is sleeveless, so I needed a jacket. Due to the ruffly-front nature of the blouse, I chose this jacket. Then the jeans, and of course, being the matchy-matchy chick I am, gotta do the purple shoes. Ta dah! I love these shoes. 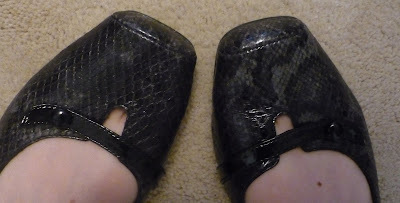 These are my Ruth shoes, since we have the same ones. Nice texture on the jacket and good buttons - pretty good quality for Ricki's. Note to self: go to bed earlier than 1am on a weeknight. Blue silk sweater (I.N.C. ), yellow patterned silk skirt (Kenzie), crystal chain belt, crystal dangle earrings, silver flats (Nicole). Man, my hair is just sucking royally lately - I hate this growning out stage. I'm getting it cut next Friday - I hope Lucy can save me from Dorothy Hamill hell. 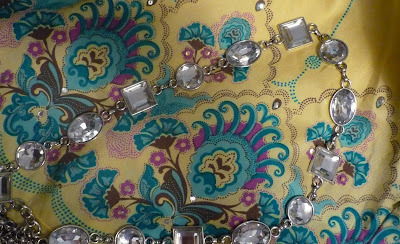 Brown, two shades of turquoise, that nice Easter egg purple and little sequins & crystals. Gorgeous. And I have the only one like it, since it's a sample and they never made any more. Wee! Ruth, thanks for all the comments - I'm still trying to find them all. Damn this blog for not telling me what post the comments belong to. Tie-front black cardigan (Vero Moda), multi-coloured patterned blouse (consignment), black shadow-stripe pencil skirt (InWear), black sling backs (Naturalizer), silver bracelet & earrings (Fossil). 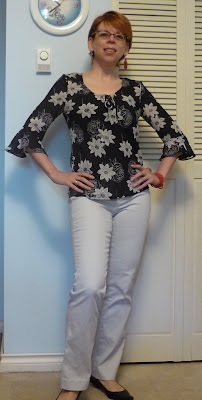 This blouse is from the consignment shop of last weekend - I'd put together outfits for all of the things I got and made a total of 6 outfits, so this one's the leftover. I was going to do it with a grey pencil skirt, but I'm feeling iffy about that particular skirt right now, so went with the black one instead. Aqua dress (Kersh), silver shoes (Nicole), yellow pattent clutch (Expressions), silk mult-coloured scarf (The Bay), silver hoops necklace & crystal studs earrings. Elaine and I did the art gallery today - a showing of some of Andy Warhol's stuff, from his early works to the pop stuff like the Marilyns. Pretty cool. It's pretty warm out today and I wanted to dress appropriate to the Pop Art theme. Love the comfort of this dress. I dyed my hair this morning, but I'm just hating the style right now, so am doing whatever I can to just make it do something. This scarf has hot pink, yellow, aqua and some other colours & I like the way it looks with the dress. Plaid blouse (Roxy, consignment), denim vest (Bisou Bisou, Michelle Bohbot, consignment), brown suit skirt (Kenzie), pink wedges (Kenzie), blue bag (The Bay), wood bracelet & earrings. I like the mix of formality of the skirt with the almost surfer chick pink and blue plaid with pearl snaps of the the shirt. The vest gives the shirt some shape, since it's pretty boxy. The shoes are probably one of the girliest things I own...yeah, they don't really go. I think I should have gone with the straw and brown ones. Dammit. That'd be a miss. Red blouse (H&M, NYC), black and white plaid corset top (Le Chateau, consignment), grey plaid pants (Vero Moda, The Bay), black leather belt (NYC), black and white shoes (Fluevog), silver and white stone necklace/earrings. I really like this outfit - and it got the Ruth seal of approval. I got a lot of compliments on it today, actually. The corset top is too young for me on its own (it makes me think of my old club-hopping/dancing days), but perfectly appropriate for work when worn over a shirt and with tailored pants. Fitted denim blazer (Bisou Bisou, Michelle Bohbot, consignment), baby blue sequined cami (Esprit), silk velvet square pattern mid-length skirt (Banana Republic, consignment), silver booties (BCBGirls, Winners), double strand pearl necklace with rhinestone/silver clasp (Grandma J. ), rhinestone stud earrings. I like this outfit quite a bit - I love how slim my waist looks in this blazer! The blazer and skirt are the two featured items, but really, I like everything I'm wearing. The blazer is beautifully tailored, with just a touch of spandex for stretch. I have never heard of this label, but after a Google search I see that it's sold at JC Penny in the US - someone must have done a little cross-border shopping. I paid $13 for it. I adore the skirt (it was about $25) - it was so comfortable all day, and so soft. I do love silk velvets (velvet is a weave and can be made from cotton, polyester blends and silk, for example). Silk velvets have a much looser drape than cotton velvets, which are quite stiff. I like the large block pattern, although I don't have a lot of colours that go with this. I'm looking forward to wearing this skirt with boots for fall/winter. We don't have Banana Republic here, so again, someone my size has been shopping in the States! 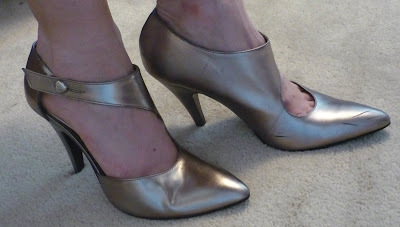 I'm not sure if I've ever worn these shoes for the blog before. I got them at Winners last fall. Are they a bootie? Are they a shoe? I just can't tell! Nice scuff marks, Sheila. 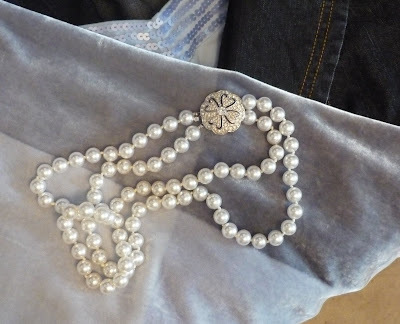 And the perfect necklace with this was Grandma J's double strand of pearls (not real pearls, just pretty costume ones). The clasp is a nice touch. This was left in the jumble after everyone picked over her jewelry. No brand stamp. Kind of looks like Coro, though. Nice close look at the skirt texture (it reminds me of snow), the sequin trim on the cami, and the stitching on the jacket. Tomorrow: Le Chateau bustier top. Grey tone patterned blouse (H&M, consignment), black pinstriped vest (Oxmo, Plum), purply-grey trousers (Club Monaco, consignment), red patent leather sling back kitten heels (Aldo), silver & stone necklace (Melanie Lynne), triple silver hoop earrings. I feel like Annie Hall. I had mixed reactions on this outfit today: Ruth was "meh" and Nicole was "cute!" I like Nicole's opinion better (nyah, Ruth, haha). I like that these neutrals (the blouse, vest and pants) all go together, then the nice pop of red with the shoe, and girly touches with the necklace & earrings. 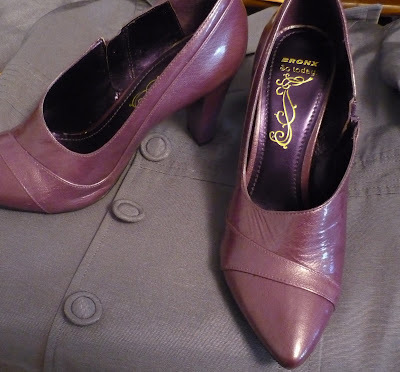 The blouse and pants are the feature items from the consignment shop - the blouse was one of the 1/2 price items, so around $8 and the pants were about $25. The blouse is lovely and silky - but washable! - and I always love finding an H&M piece here since the nearest H&M is in Vancouver (grumble). The pants were a real find - I'm only 5'4" so finding pants that are not miles too long, but also not petite (I'm a little tall for petite pants, I guess I have long legs even though I'm short), is really tricky. And finding a pair that are from Club Monaco! Gold, baby! These are the perfect length for flats -I've been looking for this length for ages. And considering that regular price Club Monaco pants are around the $125 range, I'm pretty happy. Tomorrow: denim blazer and velvet skirt. This guy is fantastic - L did a great job on the eyes. He really looks like he'd give you a beating if you crossed him. Good colour combo (like the green robe) and good work on the details. That gold bandolier really stands out. 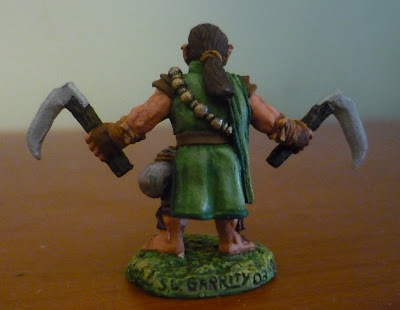 This is a really small figure (under 3 cm), so bravo on a job well done! 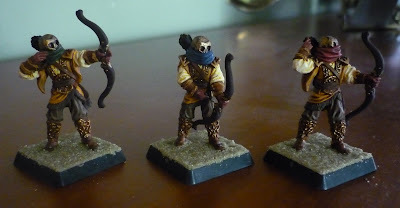 L finished these guys last weekend, but I forgot to photograph them until a couple of days ago. Each guy has a different coloured scarf to tell them apart if we use them for a fight: red, blue and green. I hate painting multiples of what is basically the same damn figure - I don't know how he does it without going insane. The copper detailing on their leather is really good. 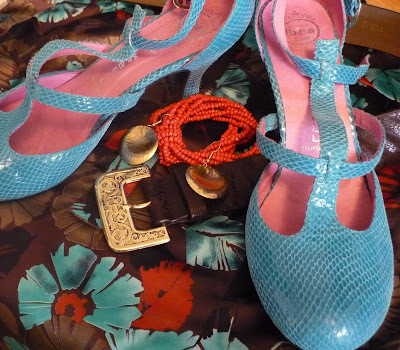 Consignment Week: Deja Vu - but with a Turquoise Jacket! 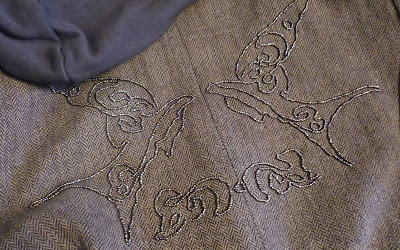 Details: see Saturday's Special Occasion outfit. Turquoise blazer (Gap, consignment). I went to my favourite consignment shop yesterday and they had a sale on! I usually don't find more than 3 or 4 things there, but since it was a sale, I was really thorough and tried on a ton of clothes. Nothing I bought was over $27 (and it was buy one, get one 1/2 off). This jacket is Gap (it has Gap buttons) and is a lovely brushed cotton. It's hard to see in the photo, but it has yellowy gold contrast stitching. It goes perfectly with all the turquoise in my wardrobe (and my turquoise shoes!). I've put together outfits for the next 5-6 days incorporating all of the new stuff I got at the consignment shop (Leche's, for those of you who shop locally). Tomorrow: H&M blouse and Club Monaco pants. Orange wrap t-shirt (InWear, Dots), rust cami (InWear, Dots), patterned full skirt (Mexx, Dots), grey cotton blazer (RW & Co.), brown/white wedge shoes (Aerosoles), brown leather clutch (Aldo), turquoise/bead necklace (Plum), turquoise/gold bangles (gift shop, vacation), gold hoop earrings. The weather is goofy today so I needed to be ready for sun and rain. Layering to the rescue! I really like this outfit - in fact, I'm going to do it on Monday for work. Maybe a different jacket. Stay-C is one of the Book Club Babes - she's due soon with her first baby. I'm not such a baby person, but I adore Stay-C, so I braved a children's store and bought her a kit for making a plaster cast of the baby's hand and foot. I ate too much cheese and had 3 glasses of wine...I'm going to have a nap. I got the necklace a couple of weeks ago at Plum, on clearance. It's real turquoise. I like the mix of turquoise and red. Turquoise and orange/red is one of my favourite colour combinations. I like this purse, but it's a weird shade of brown, kind of orangey. It was only $19.99 on sale last fall at Aldo. Taupe cropped jacket (Le Chateau), green t-shirt (Nepean), jean pencil skirt (Smart Set), psychedelic shoes (some hair salon on vacation), gold disc earrings (Plum). The usual "I'm tired" shot in the morning, this time with a bit of 'tude going on. I went easy on the accessories on Friday because Elaine and I were going shopping and I didn't want to deal with a necklace or bracelet if I was trying stuff on. We didn't end up doing that much shopping - I had to buy a gift for a baby shower then we went for dinner. 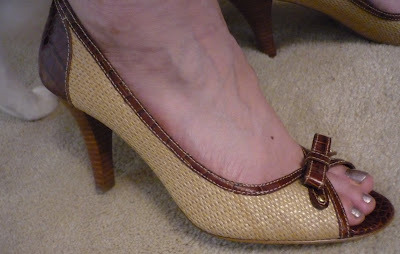 I love these shoes, but the heels are starting to wear out already! The rubber is cracking off. This displeases me. Grr. Red blouse (Winners), black cropped pants (Winners), red slingbacks (Nine West, Shoe Warehouse), black satin headband with "gems" (The Bay), crystal studs. Thursday, I had to do a speech for Toastmasters, and I wanted to make sure I didn't compete with my outfit, so I toned it down a bit with this. It was comfy, although by the end of the day, the headband ($3 in a clearance bin at The Bay) felt like it was squeezing my head with a vicelike grip. I had Book Club right after work and got home about 10pm so I was too bagged to post. I just wanted to watch the PVRed finale of "So You Think You Can Dance". Red, brown, cream patterned dress (Connections, Winners), straw/faux croc peep-toe shoes (Roberto Vianni, The Bay), wood bracelet & earrings (Oscar & Libby's), red bead bracelet (Plum). It's late (after 7 by the Dolphins clock, I see) and I'm tired. I really didn't feel like putting this back on after I got all hot and sweaty from walking home after working late yet again. But I did. Normally I wouldn't wear my bare shoulders exposed for work, but everyone is off on holidays and it's still casual month. Plus, it was bloody hot today. Love these shoes. 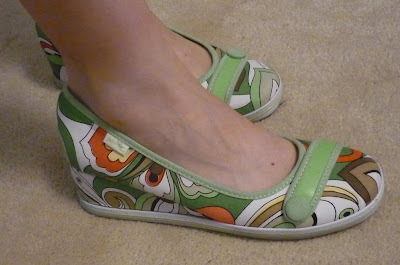 I think of them as my Cruise Ship Shoes because they remind me of going on vacation far away. 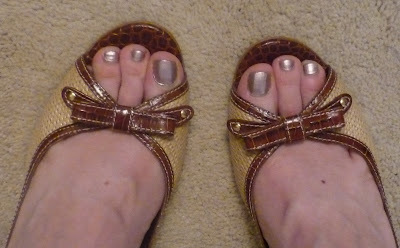 Fresh pedicure, not yet chipped or worn off at the toes from my soccer boots. I had to put this picture up, since someone has managed yet again to get into the shot. 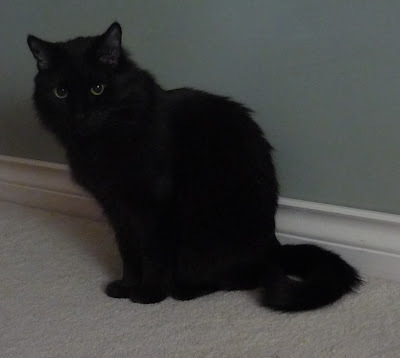 See the white paw behind my heel? A close-up of the jewelry. I felt well-accessorized today. I love this bead bracelet. 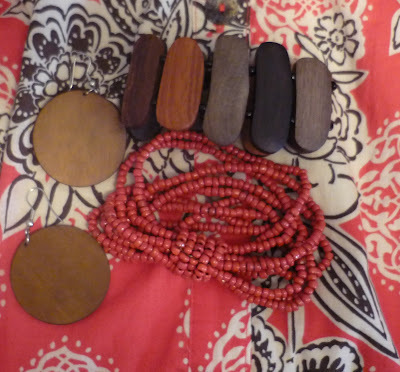 I like the mix of browns/neutrals with the red. One of my favourite combos. Yellow cardigan (Jacob), green cami (Esprit), leopard belt (Plum), denim poufy skirt (Jacob), leopard peep-toe flats (Expressions, The Bay), yellow crystal earrings (Plum), brass charm bracelet (Plum). How I love civic holidays! Yesterday was BC Day (as in British Columbia, this lovely province), so we had a long weekend, which I richly deserved after slaving away for the past few weeks. 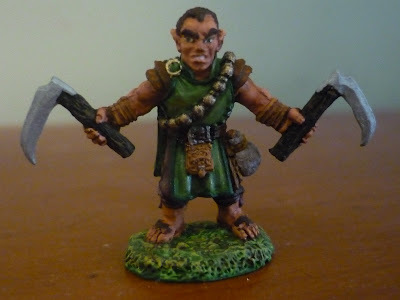 I did nothing all weekend, except read, watch movies and paint figures. It was lovely. I decided to go plain and simple with today's outfit. Pretty! 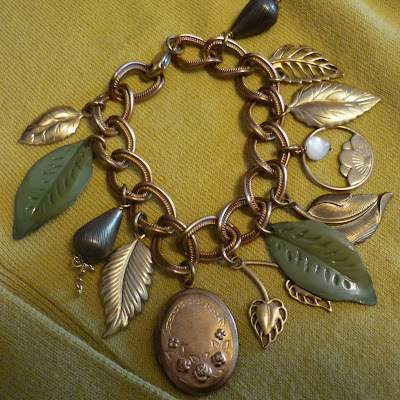 Lovely brass and green enamel and beads and yikes, I sound like a one-man band with this thing on my wrist! But so pretty. The locket even opens. Whose picture should I put in it? The kitties' pictures? My ever-so-patient husband, L? Spongebob Squarepants? Blue cami (Plum), black sleeveless t (Jacob), grey zipper-front skirt (Kensie, consignment), grey cropped jacket (Guess), grey faux snakeskin flats (Feet First), triple hoop silver earrings. Friday. Tired again. As it was still chilly, I ended up wearing the jacket all day. 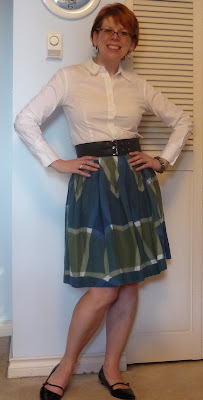 I really like this skirt, but the front of it zips all the way from the hem to the waist (and vice versa). It has a tendency to - UNZIP! - while I'm bending over, picking something up or sitting down, so I have to watch out for it.